Stuff happened in the past week that could have ended badly, but didn’t. Someone Up There still likes me. First, I seriously scraped the right front bumper and fender of my pristine, pre-owned Honda Accord, trying to wedge into a narrow spot next to a wall at Baltimore’s Charles Street Theater garage. I heard the dreaded grating sound, but didn’t look until after I’d seen the movie, Woody Allen’s “Magic in the Moonlight,” which delighted and diverted me from such mundane matters as repair costs. I’d noticed the icon indicating low gas on the way from Bel Air, and planned to fill up before returning, but annoyed about the accident, I forgot. When the car slowed down in a neighborhood near home, I just had time to park at the curb. I couldn’t call AAA, having forgotten my cell phone, and walked up to a man in the driveway to ask to borrow his. David, the Good Samaritan, happened to have a container of gas handy, and donated enough to get me moving. I could have stalled for hours on Rt. 695 or 95, or been rear-ended while waiting for help. I’m taking David’s advice to never get below a quarter tank from now on. The next day my back bumper hit an unnoticed high curb behind me as I backed out after Mass. I pulled up a bit, got out to see the pitted scrape, and a woman coming out of church stopped to commiserate. I told her what had happened yesterday, saying I knew car scars were annoying, but not that important in the scheme of life. She agreed, then told me she was soon starting chemotherapy for an abdominal tumor. I shared my story of surviving a bad prognosis, and we parted with a hug. A body shop has now expensively restored the car to its pristine state. Several days later, Angel was lying quietly near the patio door, chewing on a rawhide bone, and suddenly began choking and gasping for breath. I tried to soothe her, brought her a bowl of water, but she wouldn’t drink. When I lifted her up on her legs, she couldn’t stand and fell down again. So I carried her to the car and drove to the Animal Emergency Hospital, thankful I knew the way since Honey had been treated there. I was terrified to lose her too. At a red light I offered her water again, she drank it thirstily, and when we arrived, walked briskly around the lot on her leash. A couple who’d just left their dog asked if they could help, and advised me to have her checked out anyway. An X-ray showed some irritation in her throat, but nothing stuck there. For a couple of days I fed her a soft diet. Then, leaving Angel at her groomer, Bon Bon, I visited The Stale Fish and Boat Company, a nearby surfer shop. Not that I’m thinking of taking up surfing at this late date — though a recent balance test showed my equilibrium is excellent — but I enjoy browsing among the colorful clothes and jewelry there. A brilliantly green parrot sitting on top of its open cage looked right at me and said “Hello.” Never can ignore a friendly overture, so walked over to return the greeting, raised my arm to pet him — and he flew down and bit my outstretched hand. Ouch! A clerk pried him loose and I washed up in the bathroom. No skin broken, but it smarted for a while. After, I saw the sign: “Parrot bites.” I hadn’t seen the sign above Angel’s cage either, but when I put in my hand to touch her sweet face, she gently licked my fingers. I asked to hold her, then took her for a lively walk — and I knew we were meant to be together. What I’ve learned: Don’t squeeze car into narrow spaces. Fill gas tank when down to a quarter. Look behind car before backing up. No more rawhide bones for Angel. Observe warning signs, but follow your feelings. Keep reaching out — you’ll get hurt now and then, but you just might get loved. With apologies to my brave, hardy, elite band of followers (still can’t convince some friends and relations to read my musings) for posting “Hanging in There,” I’ve trashed that litany of complaints, realizing you’re each clinging to your own personal cliffs. Was feeling sorry for myself and looking for sympathy. And didn’t get any. After the bout with a respiratory virus, then an intestinal one, I was so weak and washed out I thought I may be near the end of my earthly journey — reminded of Redd Foxx in “Sanford and Son” clutching his chest, calling out to his late wife: “I’m coming, Elizabeth. This is the big one.” It never was. But, ironically, Mr. Foxx later died of a sudden heart attack, and onlookers assumed he was acting. I weepily told my son: “I’ve lived long enough. You’ll be better off with my condo and CD.” “Mom,” he sighed, “you were like this a year ago with the mold sickness. You’ll be fine.” I am now, thank God. But for a time I just took care of Angel, food shopped, read a lot, worked crossword puzzles, and prayed. Minding my grandson lifted me up, but when he napped after lunch, I lay down on the sofa. Bonus: I lost seven pounds which I’ve managed to keep off. I was in a kind of fog, operating on autopilot. And some vision loss in my left eye since the glaucoma surgery adds to disorientation. Everything was an effort. When I was feeling low years ago my son turned on some lively music and coaxed me to dance. I wasn’t in a dancing mood — but jumping around helped. Walking Angel recently, I met a woman and her Golden Retriever, Grace — as in “Amazing Grace.” Julie told me her mom in England spent most of her day in bed, too depressed to get up. It’s all about keeping moving, putting one foot in front of the other. It gets easier. I started to feel better just before my new grandson was born, and his arrival completed my cure. His brother squirms when I hug him too long, and he won’t sit on my lap anymore — but he’ll cuddle next me if I lure him with a storybook. The baby contentedly nestles in my arms as I sing lullabies and coo to him. That precious time goes by so fast. But it’s wonderful, too, seeing my first grandson growing, learning, becoming independent. The other day he put down his trains, went over to his brother, and gently rocked him in his little seat — all his own idea. I clapped as I watched. Just five days after the baby’s birth, another joyous blessing — my nephew Matt married his lovely Stephanie in North Sea, Southampton where his mother bought the cottage almost 50 years ago. They had crushes on each other in college, but didn’t date, lost touch for years, then reconnected on Facebook, both now in California. Matt lovingly honored his late mom by having his wedding where they had many happy summers, and where he, his brother Tim, and my son bonded from babyhood. Angel and I drove from Bel Air, breaking up the trip at the Garden City LaQuinta. My son, with his wife’s blessing, drove from Baltimore the next day with my first grandson, giving mommy and baby some quiet time together. Highlights of the wonderful wedding: Drinks and hors d’oeuvres before the ceremony under a shady tree as a violinist played. 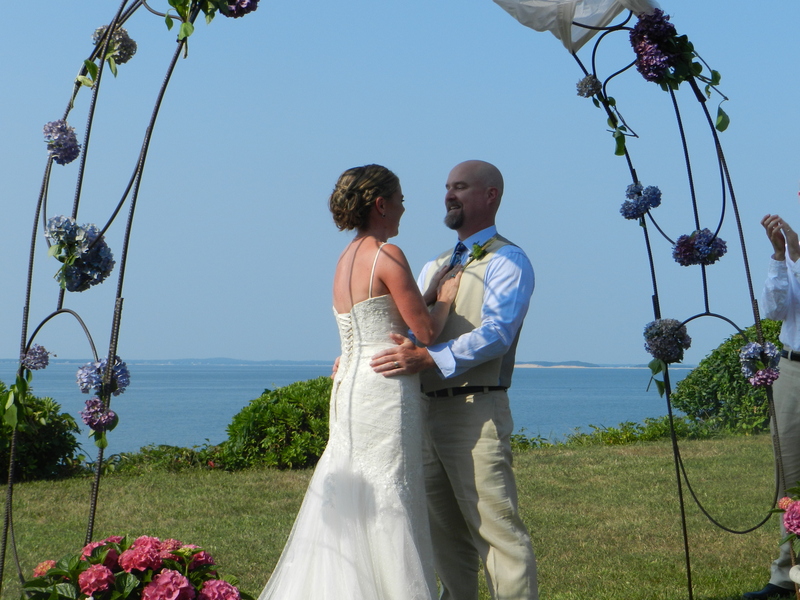 Then to the lawn above the bay where the groom waited under a trellis decorated with blue hydrangeas and a gracefully draped white sheet. My son’s doing — affirming his kindergarten report card: “When he settles down and matures, we’ll begin to see his many creative talents!” My godson Matt touchingly asking me to pin on his boutonniere. Tim’s three adorable daughters strewing petals from little baskets. The bride and groom facing each other under the trellis, holding hands as they said their vows, their attendants on either side. Violin music in the background. Followed by a sumptuous clambake reception, featuring lobsters with all the sides and fixings. I made friends with a waitress who served me seconds, including champagne refills. So when Stephanie asked if I’d give a toast, I was ready. “Would it be inappropriate if I also sang “The Moonshiner?” I wondered — the Irish drinking song I’d sung, by request, at my son’s wedding and Tim’s last St. Patrick’s party. “You definitely should,” she replied. Thus encouraged, I toasted and sang — to much applause, I’m pleased to say. I was delighted when one of the guests said she’d enjoyed my performance, and asked: “Are you an actress?” I’ve told you about dancing with my little sister for the entertainment of our parents and grandparents, and the plays from “Jack and Jill” magazine staged in my garage. I’ve also portrayed the Blessed Mother in several grammar school Nativity pageants, had chorus parts in high school Glee Club shows, and several years ago took a Continuing Ed acting class at N.Y.U. It seems I’m a ham at heart. My admirer’s husband suggested an encore, but knowing it’s better to exit before getting the hook, I thanked him, saying my repertoire was limited at present. But I’m planning to learn another song or two for the next appropriate occasion.